For many, Africa remains a “dark continent,” for all that it could swallow the United States, China, India, and a large part of Europe whole. For some, it’s an ancestral homeland which evokes both pride and sorrow. Inspired by Alex Haley’s award-winning miniseries Roots, author Judith M. Echols traveled to Senegal and The Gambia to have a personal encounter with the motherland. She returned a year later, but this time took her ten-year-old son. 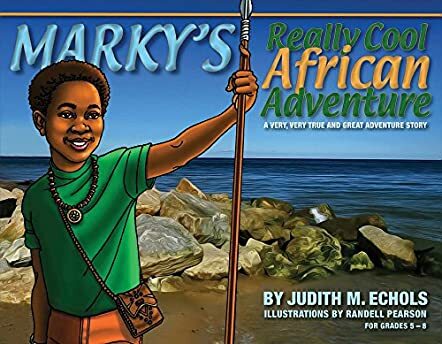 Marky's Really Cool African Adventure, with illustrations by Randell Pearson, is the story of that mother-son journey. Written from Marky’s point of view, it details every aspect of their trip: preparation, travel, lodging, and their many adventures. Dazzling full color illustrations add to the reader’s enjoyment. Marky’s Really Cool African Adventure appeals to me on several levels. It educates. Don’t let its size fool you. Echols has packed it with insights into history, geography, and culture. It reassures. A young person anticipating a first overseas trip can read Marky’s experience with passports, immunizations, food, money, and travel and be better prepared. It entertains. I enjoyed reading about young Marky making the rounds of the resort pools, his being eyed as a possible bridegroom, and losing his mom in the market. And, it touches the heart. One can’t ever again see The Door of No Return as just a wall with an opening in it and a nice view of the sea. A great read for young people, and one which illuminates a little more of the “dark continent” for us all.